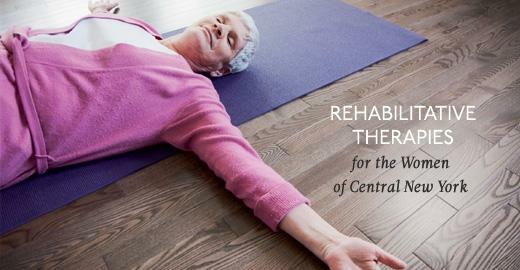 Rehabilitation aims to reduce disability, improve independence and improve a patient’s quality of life. Upstate’s vast selection of various rehabilitative therapies is offered at five locations in Central New York in an effort to make care as convenient as possible for the patient. These offices are also equipped with state-of-the-art rehabilitation equipment to help patients achieve their therapy goals with the most advanced tools possible. For questions, referrals, or to schedule an appointment, contact Upstate Women's Health. Last Modified: November 22, 2013. Contact LisaMarie Vigliotti-Bane with questions about the content of this page.